Bio fuel systems & recipies – Mac and Mac Electric Company, Inc. In addition to repairing & selling electric motors, Mac & Mac Electric is commited to a sustainable environment. 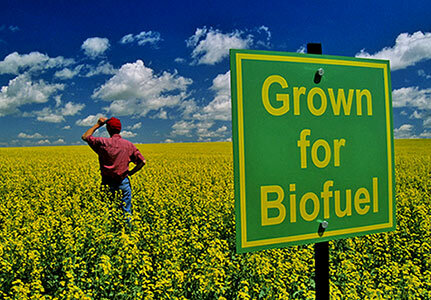 Bio Fuel Systems & Recipies information can be found throughout the internet. BioDiesel Vs. Soy Recently people have been using the terms “soy-diesel” and “bio-diesel” interchangeably. There is a major difference between the two terms and failing to recognize the difference will spell disaster for your diesel engines running on soy-diesel. 1. Filter WVO to remove any food scraps or solid particles. Filter the WVO to remove food particles. You may have to warm it up a bit first to get it to run freely, 95 deg F (35 deg C) should be enough. Use a double layer of cheesecloth in a funnel, or a restaurant or canteen-type coffee filter. 2. Heat WVO to remove any water content (optional). Many people heat the WVO first to remove any water content. Waste oil will probably contain water, which can slow down the reaction and cause saponification (soap formation). The less water in the WVO the better. This is how they do it. Raise the temperature to 212 deg F (100 deg C), hold it there and allow any water to boil off. Use the mixer to avoid steam pockets forming below the oil and exploding, splashing hot oil out of the container. Or drain water puddles out from the bottom as they form — you can save any oil that comes out with the water later. When boiling slows, raise the temperature to 265 deg F (130 deg C) for 10 minutes. Remove heat and allow to cool. You may be lucky and find a regular source of WVO that doesn’t need to have the water boiled off, in which case don’t do it — boiling means extra energy and time. Personally I don’t boil off the water first, I’d rather avoid the extra step in the process and save the energy it uses. But unless you’re sure, it may be better to be on the safe side. 3. Perform titration to determine how much catalyst is needed. To determine the correct amount of lye required, a titration must be performed on the oil being transesterified. This is the most difficult step in the process, and the most critical — make your titration as accurate as possible. IMPORTANT: The lye must be dry — keep it away from water, store it in an airtight container. Make up a solution of one gram of lye to one liter of distilled water. Make sure it dissolves completely. This sample is then used as a reference tester for the titration process. It’s important not to let the sample get contaminated, it can be used for many titrations. Mix 10 milliliters of isopropyl alcohol in a small container with a 1 milliliter sample of WVO — make sure it’s exactly 1 milliliter. Take the WVO titration sample from the reaction vessel (Figure 5 #1) after it’s been warmed up and stirred. Add to this solution 2 drops of phenolphthalein, an acid-base indicator that’s colorless in acid and red in base. IMPORTANT: Phenolphthalein has a shelf life of about a year, it is very sensitive to degradation by light so after a while it will start giving erroneous readings. Using a graduated eye dropper (with increments marked in tenths of milliliters) or some other calibrated instrument (from medical supply outlets), while carefully keeping track of the amounts, drop measured amounts of the lye/water solution a couple of tenths of milliliters at a time into the WVO/isopropyl/phenolphthalein solution. Follow each drop with vigorous stirring of the solution. In cold weather the WVO might congeal and not work so you might need to do the titration in a heated room. If conditions are right eventually the solution turns pink (magenta), and stays pink for 10 seconds. This is the indicator color for a pH range of 8-9 (see the photograph in the left column of this page, “Color of titrated liquid sample when at the correct pH”). It’s important to find the exact amount, to just reach this pH without dropping in too much! It’s a good idea to do this entire process more than once to ensure that your number is correct. I’ve found that depending on the type of WVO, how hot it got in the fryer, what was cooked in it and how long it was used, the amount of lye/water solution needed to titrate it is usually 1.5 to 3 milliliters. You can also use litmus paper or a digital pH tester instead of the phenolphthalein. Try it with fresh cooking oil from your kitchen too, it should need much less lye to reach pH 8-9. The next step is to determine the amount of lye needed for the reaction. Take the number of milliliters derived from the titration and multiply by the number of liters of WVO to be transesterified. There is one more thing to be included in the calculation. Every liter of neat vegetable oil (fresh — never been cooked) needs 3.5 grams of lye for the reaction. So for every liter of WVO to be transesterified add an additional 3.5 grams of lye. Example: The titration determined that it took 2.4 milliliters to reach pH 8-9 and you’ll be transesterifying 150 liters of oil. If the titration result was 1.8 milliliters to reach pH 8-9, the final amount of lye needed for the reaction would be 795 grams. I’ve found over time that the number of grams of lye needed per liter of WVO has generally been between 6 and 7. The first few times you do this process or if you’re planning on transesterifying a lot of WVO it is a good practice to first try out your lye amounts on a 1 liter batch in a kitchen blender. This works really well and you don’t need to heat up the WVO too much, just enough so it will spin well in the blender. Blenders are very thorough at mixing the ingredients so heating is not as critical. Start by mixing up the lye and methanol in a blender (one that will never be used for food again). First make sure the blender and all utensils used are dry. Forming the exothermal sodium methoxide polar molecule will heat up the blender container a bit. Keep mixing until all the lye has been dissolved. Once the sodium methoxide is prepared, add to the blender 1 liter of WVO. Make certain all your weights and volumes are precise. If you’re unsure of the titration result numbers then use 6-6.25 grams of lye per liter of used WVO, or 3.5 grams for fresh vegetable oil. Blender batches need only be run for about 15-20 minutes for separation to be completed before switching off. The settling takes some time to complete. The solution can be poured from the blender into another container right after switching off the blender. It is good to do a few batches with varying amounts of lye recorded so later when checking results one can choose the lye quantity that did the best job. When too much lye is used the result can be a troublesome gel that is tough to do anything with. (See Glop soap.) When not enough lye is used the reaction does not go far enough so some unreacted WVO will be mixed with the biodiesel and glycerine. This will form three levels with biodiesel on top above unreacted WVO with glycerine on the bottom. If there is too much water in the WVO it will form soaps and settle right above the glycerine forming a fourth level in the container. This layer is not too easy to separate from the unreacted WVO and glycerine layers. Generally the amount of methanol needed is 20% of the WVO by mass. The densities of these two liquids are fairly close so measuring 20% of methanol by volume should be about right. To be completely sure, measure out a half-liter of both fluids, weigh, and calculate exactly what 20% by mass is. Different WVOs can have different densities depending on what type of oil it originally was and how long it was used in the deep fryer. Example: When transesterifying 100 liters of WVO, use 20 liters of methanol. The methanol is mixed into a solution with the sodium hydroxide (lye), creating sodium methoxide in an exothermic reaction (ie it gets warm from bonds forming). Keep all utensils the lye comes in contact with as dry as possible. Treat sodium methoxide with extreme caution! Do not inhale any vapors! If any sodium methoxide gets splashed on your skin, it will burn you without your feeling it (killing the nerves) — wash immediately with lots of water. Always have a hose running when working with sodium methoxide. Sodium methoxide is also very corrosive to paints. Lye reacts with aluminum, tin and zinc. Use glass, enamel or stainless steel containers — stainless steel is best. Used restaurant equipment supply stores and scrap metal recycling yards are two good places to look for this type of equipment. Braze on plumbing fittings for drains, etc. where needed. 5. Heat WVO, mix in the sodium methoxide while stirring. Pre-heat waste vegetable oil reclaimed from a restaurant’s waste grease barrel to 120-130 deg F (48-54 deg C). A propeller or paint stirrer coupled to a 1/2-inch electric drill held securely in a jig works fine as a mixer. Too much agitation causes splashing and bubbles through vortexing and reduces mix efficiency. There should be a vortex just appearing on the surface. Adjust the speed, or the pitch or size of the stirrer to get the right effect. If you want a quieter processor, an electric pump plumbed to form a mixing loop for stirring the WVO would do a nice job. Mount the pump above the level that glycerine will gel at to prevent clogging up the pump (see below). Add the sodium methoxide to the WVO while stirring; stir the mixture for 50 minutes to an hour. The reaction is often complete in 30 minutes, but longer is better. The transesterification process separates the methyl esters from the glycerine. The CH3O of the methanol then caps off the ester chains and OH from the NaOH (lye) stabilizes the glycerine. 6. Allow to settle , remove the glycerine. Allow the solution to sit and cool for at least eight hours, preferably longer. The methyl esters — biodiesel — will be floating on top while the denser glycerine will have congealed on the bottom of the container forming a hard gelatinous mass (the mixing pump must be mounted above this level). An alternative method is to allow the reactants to sit for at least an hour after mixing while keeping the brew above 100 deg F (38 deg C), which keeps the glycerine semi-liquid (it solidifies below 100 deg F). Then carefully decant the biodiesel. This can be done by draining the reactants out of the bottom of the container through a transparent hose. The semi-liquid glycerine has a dark brown color; the biodiesel is honey-colored. Keep a watch on what flows through the sight tube: when the lighter-colored biodiesel appears divert it to a separate container. If any biodiesel stays with the glycerine it is easy to retrieve it later once the glycerine has solidified. If you left the mixture in the tank until the glycerine gelled, reheat the tank just enough to liquify the glycerine again. Don’t stir it! Then decant it out as above. Figure 4 shows one example of a system for separating two liquids with different densities. This could make a good pre-filter or be used to separate oils, soap and glycerine/esters goop. Marine/boat fuel cleaning systems do a good job of filtering. Figure 5 shows the reaction vessel (#1) where the WVO is mixed (also could be done with a pump) and heated. Heating is accomplished by (#2) a hotplate, propane-burner, or a diesel stove would work well. A proposed alternative using very little electricity is illustrated in Figure 6. This system would use a furnace-type burner run on reclaimed esters to heat its reaction vessel. The vessel’s stirring action is created by thermo inversion currents generated by the vessel’s external cooling tubes and a baffled exhaust vent that runs up through its center. Figure 5 also shows a blender (#3) used to mix up the sodium methoxide. When making 16 liter (5 gal) batches, I use a yard-sale glass blender for the sodium methoxide solution (and for nothing else! ), but I can’t fit it all in at once, so I measure out three separate portions. The glycerine from WVO is brown and usually turns to a solid below about 100 deg F (38 deg C). Glycerine from fresh oil often stays a liquid at lower temperatures. Reclaimed glycerine can be composted after being vented for three weeks to allow residual methanol to evaporate off or after heating it to 150 deg F (66 deg C) to boil off any methanol content (the boiling point of methanol is 148.5 deg F, 64.7 deg C). The excess methanol can be recovered for re-use when boiled off if you run the vapors through a condenser. Another way of disposing of the glycerine, though a great bit more complicated, would be to separate its components, mostly methanol, pure glycerine (a valuable product for medicines, tinctures, hand lotions, dried plant arrangements and many other uses — see Glycerine) and wax. This is often accomplished by distilling it, but glycerine has a high boiling point even under high vacuum so this method is difficult. I was able to find someone who could use my glycerine (for dried flower arrangements) through the Industrial Materials Exchange (IMEX) in Seattle. IMEX has a publication that comes out every other month with listings, looking for and offering all types of surplus industrial materials. Many areas have similar exchanges. The glycerine by-product makes an excellent industrial-type degreaser/soap. One way to purify it is heat it to 150 deg F (65.5 deg C) to boil off excess methanol, making it safe for skin contact (take precautions with fumes). Once the glycerine is back to a liquid the impurities sink to the bottom and the color will become a more uniform dark brown. This can be cut with water leaving it a tan color, less concentrated and softer and easier to handle when washing hands. Produced this way the degreaser could be sold in squeeze or pump dispensers. Other ideas for disposing of the glycerine are breaking it down to usable methane gas, with a methane digester or, for a much wilder idea, it could be broken down with pyrolisis. Pyrolisis was used extensively to run cars on firewood in oil-scarce Europe and elsewhere during World War 2. The processor has a heat source that heats the fuel (wood or glycerine) in an airtight box without oxygen. This allows the fuel to release its methane while not allowing it to burn. The methane is trapped in an inflatable storage container or compressed into a tank. This is an area of biodiesel development that warrants further work. Suspended in the biodiesel will also be some soapy residues. These are the result of Na+ ions from the sodium hydroxide (NaOH) reacting with water created when the methanol bonds with the ester chains along with any other water that was suspended in the WVO. The part of the process where it’s vital to keep all water out of the reaction is when making the sodium methoxide. Keep the blender and all utensils the lye comes in contact with as dry as possible. The chances of a good clean splitting of esters from glycerine with little soap by-product are much better on a warm dry summer day than on a damp winter day. There is more than one school of thought on getting the biodiesel from this stage to the fuel tank. One is to let it sit for a while (about a week), allowing the majority of the soap residues to settle before running the biodiesel through a filtration system then into the vehicle/home fuel tank. Another method is to wash the soaps out of the fuel with water, one or more times. When washing biodiesel the first time it’s best to add a small amount of acetic acid (vinegar) before adding the water. The acetic acid brings the pH of the solution closer to neutral because it neutralizes and drops out any lye suspended in the biodiesel. Figure 7 shows a simple way of washing using a translucent PVC type container with a valve 3-4 inches from bottom. For 5 gallon batches use those 5-7 gallon buckets found everywhere these days. If a translucent container can’t be found one fabricated with a sight tube (#6) ought to work. Fill with water until it is halfway between the container’s bottom and the valve, then fill up with the biodiesel to be washed. After a gentle stirring (keep it gentle, you don’t want to agitate up soaps) followed by 12-24 hours of settling, the oil and water will separate, the cleaned oil can be decanted out the valve, leaving the denser soapy water to be drained out the bottom (#5). This process might have to be repeated two or three times to remove close to 100% of soaps. The second and third washings can be done with water alone. After the third washing any remaining water gets removed by re-heating the oil slowly (Figure 8), the water and other impurities sink to bottom. The finished product should be pH 7, checked with litmus paper or with a digital pH tester. The water from the third wash can be used for the first or second washes for the next batch. The impurities can be left in the re-heater for the next batch and removed when it accumulates. The soaps can be concentrated, left-over biodiesel can be decanted out and what’s left is a biodegradable soap good for many industrial-type uses (degreasers etc.). I had some success with trapping the concentrated very hydrated sodium from this soap. The way I did this was by pouring the soap onto a stretched cheese cloth and allowing the water to run through leaving the sodium on the cloth. This is as far as I’ve gone with this so far but it seems one could press much of the water from the sodium then vacuum dessicate this saturated sodium under dry conditions back to a usable sodium hydroxide. Transesterified and washed biodiesel will become clearer over time as any remaining soaps drop out of the solution. Another idea I have been working with is chilling down the biodiesel thus allowing the soaps to condense and settle out faster. When the oil gets chilled it seems to speed up the settling of the residual lye. With a short settling time the oil clears considerably. Some experimenters are getting good results with the Idaho bubble washing technique. It takes longer, but uses less water. They find it very effective, giving a clean, polished product. Here’s how they do it. The bubbles are formed by compressed air passing through an air stone. For a small installation, buy an aerator at an aquarium shop — they come in several sizes and cost about $10 to $40. Sometimes they have a filter attached — throw it away. Add about 30 milliliters of vinegar (acetic acid) per 100 liters of biodiesel and then about 50% water. Then drop in the air stone. The air stone sinks to the bottom of the tank. When you switch on the aerator, the air bubbles rise through the biodiesel, carrying a film of water which washes the biodiesel as it passes through. At the surface, the bubble bursts, leaving a small drop of water which sinks back down through the biodiesel, washing again. If the mixture is still cloudy after a couple of hours, add a little more vinegar. Bubble-wash for 12 hours or longer (up to 24), then drain off the washing water, skim off any wax floating on top. Repeat the bubble wash two more times; keep the water from the 2nd and 3rd wash for washing the next batch. For severe soap formations, first heat the biodiesel/soap mixture to 122 deg F (50 deg C). Add enough vinegar to bring the pH to slightly below 7. Stir for half an hour, cool and continue with bubble drying as usual. The quality of the fuel product can be checked by visually examining it and checking its pH. The pH of the finished product can be checked with pH paper or a digital tester. It should be neutral (pH 7). It should look like clear vegetable oil with a light brown tint, similar to filtered apple cider. There are not supposed to be any films, particles or cloudiness to it. Films would be remaining soapy residue, re-wash or re-filter it at 5 micron or finer. Cloudiness would be water still in it, re-heat it. Particles could be anything and indicates the filter is failing. Any oils will clear up considerably when heated but the test is, when it cools back down is it still clear? If it is not yet clear then allowing it to settle out for an additional week or two should be enough to clear it up. For final filtering it is best to use a marine-type fuel filter — the ones with a transparent canister so it is possible to keep an eye on the fuel’s clarity. I used to trust when I washed it to just pouring fuel into the tank through folded cheesecloth in a funnel. After running into an increased number of dirty fuel filters I’ve become more careful. It is important to know also that biodiesel does a great job of cleaning up fossil diesel fuel films coating the interior parts of any old diesel engine. For this reason, take care to check and change your vehicle’s fuel filters when first switching over to biodiesel. I like putting a small, cheap, clear or translucent plastic in-line fuel filter right before my vehicle’s stock filter. This will prefilter the fuel before it reaches the vehicle’s fuel filter, which is more expensive to replace. This also makes it easy to see when fuel is flowing and to keep an eye on the condition of the filter. Another cold-weather idea is the two-stage method recommended by Aleks Kac. He has found that doing the reaction this way leaves him with a fuel that works better in colder conditions. There can be an increased rate of corrosion of rubber parts in the fuel system over time with 100% biodiesel. Newer cars do not use rubber parts. Biodiesel has been used in many older motors without any problems. Viton parts are best, but others are just as good. Check this table: “Durability of Various Plastics: Alcohols vs. Gasoline”, see Methanol. See also Biodiesel and your vehicle. For anyone interested in biodiesel and other renewable energy sources I encourage you to look through the extensive Journey to Forever website. This is a most exciting project so please spread the word about it. Thanks go to Keith and Midori at Journey to Forever, the creators of The Fat of The Land video, to Tom Reed for the assistance he gladly dispensed to me when I first got started, Aleks Kac, Terry de Winne (“Terry UK”), Dave Elliott (“Dave UK”), Bill Battagin, Martin Steele, Peter Pessiki at the Evergreen State College (TESC) in Olympia, Washington, USA, and the many interesting and generous contributors at The Biodiesel Discussion Group and Message Board. Have fun with it. And be safe! For any questions or comments on how this project works out for you I can be reached at Renewablenergies@yahoo.com. And once you have a system up and running send pictures and how-to’s to info@journeytoforever.org so we all can share what you have learned. Mike’s company, Olympia Green Fuels in Olympia, Washington. This information is for informational purposes only, Mac & Mac Electric accepts no responsability for acts involved with this information.